While testing with the Hitch TLS proxy in front of Varnish I stumbled upon a slow startup with a large amount of certificates. In this case we (at PCextreme) want to run Hitch with around 50.000 certificates configured. Safe for large installations: performant up to 15 000 listening sockets and 500 000 certificates. I started testing on my local desktop with 15.000 certificates. My desktop is a Intel NUC with Ubuntu 14.04. A 10 minute startup time for Hitch is rather long. We started searching for the root-cause. After some searching we discovered the OpenSSL version in Ubuntu 14.04 was the problem. Testing with Ubuntu 15.10 showed us different results. 18 seconds is a lot better than 10 minutes! Ubuntu 14.04 comes with OpenSSL 1.0.1f and Ubuntu 15.10 with 1.0.2d and that is where the difference seems to be. After this we started testing with 100k certificates. It took 48 seconds to start with that amount of certificates configured. For production we will use Ubuntu 16.04 which has similar results as Ubuntu 15.10. So if you find Hitch slow when starting, check your OpenSSL version. With the ‘new’ style for configuring bonding under Ubuntu your bond device will not always have the same MAC address across reboots. During boot, both interface p9p1 and p10p1 will be hot-plugged under bond0. The first device to be plugged into the bonding device determines which MAC address the bonded device gets. This has been filed as bug #1288196 with Ubuntu, but no fix from that side so far. This makes sure p10p1 always comes online 5 seconds after p9p1. Choose what you prefer or works best in your situation. By default a laptop charges all the way up to 100% State of Charge, something which is very bad for a battery. There is a great video on Youtube about this if you want to know all the ins and outs. The bottom line is that I wanted to limit the charge level to 90% for my laptop. Up until now I did this manually by pulling the plug at certain points, but that didn’t always work. I sometimes forgot and the battery would charge up to 100%. On Github I found the tpacpi-bat project which allows you to limit the charge level of your battery. As far as I know the X1 Carbon has 3 batteries, so for all three we set the charge limit to 90%. This is not persistent after reboots, so we have to set it every time we boot. You’ll now see that your battery charges to 90% at max. Recently we purchased a EqualLogic PS6000XVS for a KVM environment. In most of our iSCSI systems we use Multipath I/O, we do this by giving the iSCSI Target two NIC’s and give each NIC a IP-Address in a different subnet over a physically different network. This way we have two seperate I/O path’s to the iSCSI Target. The EqualLogic does not support this, it only supports one virtual IP in one network, so multipathing gets a bit difficult. On the Dell Wiki there is configuration howto, so I read that carefully. The examples are for RedHat, but we are using Ubuntu, but that should not make a big difference, but it did…. Our storage network is in the subnet 192.168.32.0/19 where the virtual IP of the EqualLogic is 192.168.32.1. You should know, this is a virtual IP, in total we have three PS6000 nodes, which do some magic by responding with a different MAC Address for 192.168.32.1 towards each client. It took some work to get this working. Bot NIC’s are connected to the same subnet, through different switches though. The first problem you will run into is the ARP flux problem of Linux, I’m not going to write to much about this, on the internet there is more then enough information written about this topic. For Open-iSCSI I created two interfaces called ieth0 and ieth1 and routed my iSCSI traffic through them. How you can do this can be found at the Dell wiki. # prevent some spoofing attacks. This should work under Ubuntu 10.04. Took me some time to figure it all out, but now it’s working like a charm. But still, I prefer multipathing over two different VLAN’s and subnets, really odd that the EqualLogic does not support this! 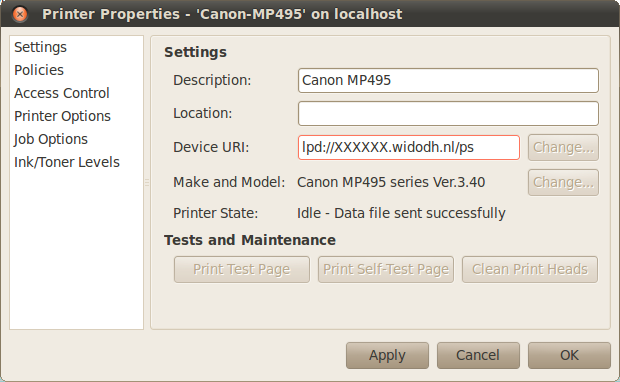 Yesterday I posted that my new Canon Pixma MP495 also supports IPv6. I had to test if I could print over IPv6, so I switched from IPv4 to IPv6 in the printer configuration (Note: You have to select IPv4 or IPv6, there is no Dual-Stack!). Before doing so I wrote down the MAC Address of the printer, I would need that to find it on my network, since the printer would get a IP from the Router Announcements my Linux router send out. After turning on IPv6 the printer got his address within a few seconds and I was able to browse through the webinterface with Firefox. Now I wanted to print over IPv6, the first thing I checked was if CUPS under Ubuntu 10.04 supported IPv6. It seems that CUPS supports IPv6 since version 1.2 and Ubuntu 10.04 is shipped with CUPS 1.4, so that was OK.
Then I created a DNS record for my printer, I pointed a AAAA-record to my printer, just so I dind’t have to type the address all the time. And DNS has been developed for NOT typing IP-Addresses, isn’t it? Now I had to configure CUPS to print over IPv6, my goal was to do this via the GUI and not use any command-line stuff, that was even easier that I thought. Your are all set, the printer should work over IPv6 after this steps. Happy printing over IPv6! The last few weeks I spend a lot of time upgrading Ubuntu 9.10 systems to 10.04, these systems are SuperMicro blade systems with 2 NIC’s per blade. By using bonding (active-backup) we combine eth0 and eth1 to bond0. On top of the bond we use 8021q VLAN’s, so we have devices like bond0.100, bond0.303, etc, etc. Those devices then are used to create bridges like vlanbr100 and vlanbr303 to give our KVM Virtual Machines access to our network. Under Ubuntu 9.10 and before this setup worked fine, but under Ubuntu 10.04 we noticed that the network inside the virtual machine wouldn’t work that well. The ARP reply (is-at) would be dropped at the bridge and didn’t get transferred to the Virtual Machine. If I’d set the arp manually inside the VM, everything started to work, but ofcourse, that was not the way it was meant to be. After hours of searching I found a Debian bugreport, that was exactly my problem! It seems that Ubuntu’s ifenslave-2.6 package (1.10-14) under 10.04 has exactly the same bug. Backporting the ifenslave package from 10.10 (1.10-15) fixed everything for me, my virtual machines would start to work again. I created a bug report for this at Ubuntu, hopefully they will fix it in 10.04 rather quickly.